1.2 How to take supplementation with folic acid (vitamin B9) during pregnancy? 1.4 Is it imperative for pregnant women to take folic acid? 1.5 Can one do without the supplement if the diet is rich in folic acid? 1.8 How long to take this pregnancy supplement? 1.9 How or when to take this supplement? 1.10 What type of folic acid (vitamin B9) supplement is best? 1.12 Is it recommended that pregnant women take 5-MTHF? 1.13 Are multivitamins recommended in pregnancy? Folic acid (vitamin B9) is a water-soluble vitamin B group that is recommended to take during pregnancy, along with vitamin B12 (cobalamin). The main purpose of this supplementation is to ensure a good development of the fetus during pregnancy. How to take supplementation with folic acid (vitamin B9) during pregnancy? Can one do without the supplement if the diet is rich in folic acid? How long should vitamin B9 be taken? What amount of vitamin B9 should be taken? What is the best folic acid supplement (vitamin B9), or which ones are recommended? Is it recommended that pregnant women take 5-MTHF? 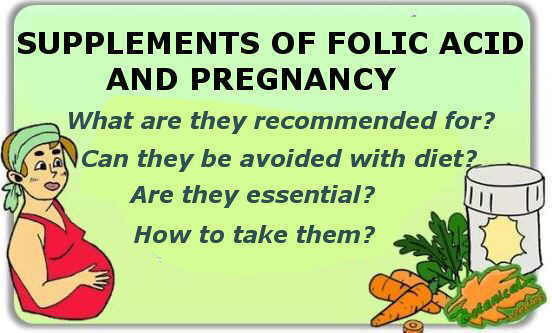 Is it imperative for pregnant women to take folic acid? It is recommended that all pregnant women take this supplement, as there is no kind of risk or toxicity, and supplementation may have potential benefits. During pregnancy the requirements of this vitamin increase significantly. Some women are reluctant to take supplements and the question is often asked whether it is possible to substitute folic acid supplements for a diet rich in vegetables. If we were talking about healthy people, it is not necessary to take folic acid supplements since this vitamin must be provided by a healthy diet. However, in case of pregnancy or suffering from certain diseases, it is highly recommended to take supplements, at least for a few weeks or months, without replacing a diet rich in this vitamin. Folic acid supplements are one of the most harmless that exist, as they have been tested in high doses, and have no toxicity or contraindications. Everything indicates that they can provide many more benefits than disadvantages. To ensure a good intake of folates in the diet, it is always recommended to increase the consumption of all types of green vegetables and leaf, regardless of whether supplements are taken or not. This recommendation is also due to the high nutritional value of foods naturally rich in folic acid, which also provide other nutrients. Foods rich in folic acid are mainly green leafy vegetables, such as spinach, Swiss chard, broccoli, etc. Legumes, fruits and nuts (without frying and without salt) are also good sources of this vitamin. It must be taken into account that, when boiling vegetables, part of this vitamin is lost in the cooking broth (it is water-soluble). Recipes very rich in folic acid would be steamed broccoli, cream of vegetables, sautéed leaf vegetables cream , etc. The usual dose of supplementation is usually 400 mcg daily of folic acid, combined with 1,000 mcg of vitamin B12, since folic acid decreases the levels of this last vitamin. It is recommended to check the label and see clearly this dosage. How long to take this pregnancy supplement? It is advisable to take vitamin B9 if possible before conception, to improve the quality of the genetic material. If pregnancy has already occurred, from the first weeks of pregnancy and until delivery. How or when to take this supplement? What type of folic acid (vitamin B9) supplement is best? In general, all vitamin B9 supplements on the market are adequate. It is recommended to look for those supplements that clearly indicate how much folic acid they contain per pill or tablet. Supplements that contain a special form of folic acid: It is a more active type, called methyl-tetrahydrofolate (also called 5-methyl-tetrahydrofolate, 5-MTHF or methylolphin). The biggest drawback of vitamin B9 in the form of methyl-tetrahydrofolate is that its price is more expensive than “normal” vitamin B9. 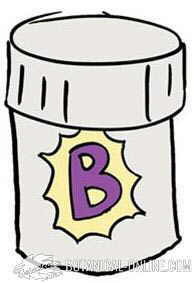 Drawing of vitamin B supplement. Folic acid or folate is vitamin B9. Healthy people and pregnant women can take “normal” folic acid. It is only important that some pewople take vitamin B9 in its most bioavailable form, that is, in its “methyl” (methylfolate or methylolphin). This refers to people who are in the following cases: people who smoke, people with high homocysteine ​​levels, people with chronic renal failure. You can take the methyl form in pregnancy, but there are some professionals who are reluctant to this type of supplementation. The main reason to discourage this supplement in pregnant women is caution. Ask your doctor what you recommend in your particular case if you have questions. 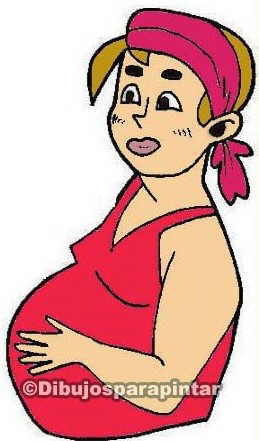 Drawing of woman in pregnancy. In a double-blind 2015 study of more than 100 pregnant women, it was determined that there was no difference between using “normal” vitamin B9 and the “methyl” form. It is also worth mentioning that women who used the “methyl” form had no more or less problems than those who used the “normal” form of the supplement. Although it may seem that this potent form of vitamin B9 is more “effective”, its toxicity is also a little less investigated. Many times “vitamin B9 methyl” (methyl-tetrahydrofolate) supplements are accompanied by B6 and B12 (also in its methyl form). High doses of vitamins can have unexpected effects. Are multivitamins recommended in pregnancy? It is not recommended to take multivitamins during pregnancy. Only the 4 nutrients that are required, such as vitamins B9 and B12 already mentioned in the text, iodine and sometimes iron, should be taken. For the rest of nutrients, it is not necessary to take any supplement since it is much better to get them through food. In addition, some supplements that appear harmless can be toxic or harmful by containing vitamins in an inadequate or chemical form, as is the case with some vitamin A supplements (retinoids) or some forms of vitamin E.